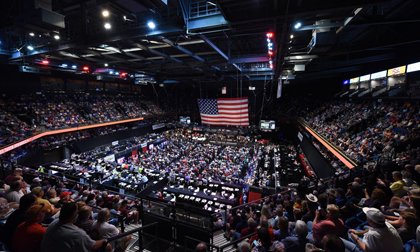 UNCASVILLE, CONN. – May 10, 2018 – Building off a record-breaking 2018 Palm Beach Auction, Barrett-Jackson is returning to Mohegan Sun in Connecticut for its 3rd Annual Northeast Auction, June 20-23, 2018. In addition to the collector car and automobilia auctions, The World’s Greatest Collector Car Auctions® will bring a host of automotive lifestyle activities as part of the first event in Mohegan Sun’s newly built 125,000-square-foot Expo Center. The week kicks off on Wednesday, June 20 with Family Value Day – a preview day for consignors, bidders and fans to experience all the automotive lifestyle activities in addition to looking at all the auction vehicles and automobilia items before they begin crossing the block on Thursday. In addition, the Motor Trend Live Stage will stream live coverage during the auction, with expert analysis on vehicles moments after they cross the auction block. Live television coverage of the event will be on Velocity and Discovery Channel; full television details have yet to be announced. A full schedule with exact times is available at Barrett-Jackson.com. The driving theme for Barrett-Jackson in 2018 is the company’s first yearlong charity initiative, Driven Hearts. Designed to help raise awareness and money for the American Heart Association, Barrett-Jackson helped raise more than $350,000 at the 2018 Scottsdale Auction, followed by an additional $180,000 in Palm Beach, bringing the total to over $530,000 to date in 2018. The third of four commemorative license plates will be unveiled leading up to the Northeast Auction and will be on all auction cars, as well as available for purchase at the auction and online at ShopBarrettJackson.com, with proceeds benefiting the American Heart Association. Fans continue to have the opportunity to engage with the campaign on social media using #DrivenHearts, and Barrett-Jackson will auction a 35th Anniversary Corvette donated by Charmaigne and Darrell Pullen (story), with 100 percent of the hammer price benefiting the American Heart Association. More information on the campaign can be found at DrivenHearts.org.